Easter is about change and hope. With Christ has risen and he gave us a change and hope, you all know, St Paul, a very famous Christian theologian who probably defined what Christianity is all about. And St Paul, his main theology was around resurrection. His, the core of his theology was on the resurrection. So when you read his writings, everything is surrounded around by resurrection. Why? Because he changed after he met the risen Christ. After he experienced the power of the risen Christ, the power of Resurrection, he became a changed person. And as a changed person, he wrote all his writing. Probably more than half of the New Testament is written by St Paul before he met the risen Lord, he basically followed what everybody else was doing and he was doing pretty well. He was going really well with his life, but he didn’t know the essence of life that is filled with vitality. He didn’t have that. He did very well, but he didn’t have a life that is filled with vitality. Once he changed, he saw what he was missing and he saw that life was missing in my life and he started pursuing life. His eyes were open and he started seeing everything so differently and a radically new way. That’s why he got so many insights, almost like life wisdom and insight were poured out upon him. When he changed and when he started seeing everything differently, all the wisdom and insights about life, about himself and about God, he had all that. After he met the risen Lord, that’s why he was able to write more than half of the New Testament. He experienced the power of the risen Lord. God, who was dead to Paul, came alive. In other words, God became resurrected within Paul. Paul emphasizes today the risen Christ appeared to many people. This is what he said and that he was buried and that he was raised on the third day in accordance with the scriptures and that he appeared to Cephas, that’s Peter, then to the 12. Then he appeared to more than 500 brothers and sisters at one time, most of whom are still alive though some have died. Then he appeared to James then to all the apostles. Last of all, as to someone untimely born, he appeared also to me. He emphasizes the appearance of the risen Lord. Why did he emphasize that so much? And as I reflect on it, it was not really appearance that Paul emphasized. He emphasized on the change, this appearance made in these people. That’s why you said even to me, untimely born even to me, he appeared and he changed me and he said, I am who I am by God’s grace. And not only be me but all these people that risen Lord appeared and they, every single one of them changed. That was his focus and emphasis, not just appearance of the risen Lord but the what the appearance did to the people. The real evidence of resurrection is of witnesses. They changed so much after meeting Jesus Christ. We may not have physical evidence, but we have a lot of witnesses. Look at disciples. If you know the scripture, you know disciples in the scripture very well. Jesus always told them, how foolish are you? How long do I have to stay with you? While the disciples were with Jesus, they didn’t have any idea of what they’re hearing. They didn’t understand what Jesus was saying. Every time they misunderstood what Jesus was saying, they did not even have great faith either. That’s why they were always scolded by Jesus, but after they met the risen Lord, they have changed so much. They experienced the power of resurrection and from then on they didn’t care whether they will be persecuted or not. They went out and proclaim the message of the risen Christ. They didn’t care about their own life, own death. They cared about the message that they receive. The disciples completely changed after the risen Lord. If Jesus just died, then they would have fabricated that and then give their lives for the phony thing? For the lie? Because they have changed after meeting the risen Lord, they became different people. Resurrection is not a theory. Resurrection is the power, power to change. When you approach the resurrection only as a theory, you’ll never understand why the resurrection is all about. You cannot open the secret of the reality of the resurrection. But once you experience the power that comes from the risen Lord, then you’ll understand the power of resurrection. They all experienced that power of resurrection and they changed and they proclaimed the message of resurrection to others. Even now, the risen Christ is changing us, the power of resurrection gives us hope that defeats the despair. It gives us the courage that defeats fear. It gives us peace and reconciliation that defeats the division and hatred it gives us life that defeats the power of death. 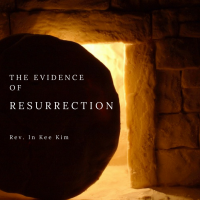 The evidence of resurrection is not out there. It is within you. When you have the risen Christ within you, you will bear the fruit of the resurrection and that fruit is evidence of the resurrection. The risen Christ is with us today and we still celebrate the life he gave to us.